In order to avoid time off due to injuries, we suggest doing activities that help prevent and overcome injuries to the soft tissue. One of those activities is rolling. Rolling is a form of self-myofascial release that is commonly used by health & fitness professionals. A myofascial release technique is intended to address localised tightness in the fascia, and trigger points in the muscle. This localised tightness may be impairing proper movement by causing pain or limiting range of motion, or both! How does ball rolling work? There are numerous theories about why ball rolling has been shown to increase range of motion and decrease pain. Some of these theories are older and based on changing the dynamics of the tissue. At RockTape, they believe in neurophysiological models, which are now becoming more widely accepted than the older, mechanical models. Ball rolling is thought to send information to the brain which enhances muscle preparedness (activation). It can also help muscles relax. In this way, myofascial release sends signals to the brain through nerves, which then signals to the muscle to turn on or relax, almost like a switch. This model assumes that muscle tissue is responsible for the tightness and that it is muscle tissue that is being changed by treatment. 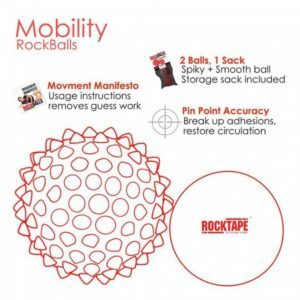 This is also why using RockTape kinesiology tape with ball rolling is incredibly effective; they both activate the neuromuscular system. Researchers have suggested that self-myofascial release techniques may improve issues such as; pain and poor circulation, that may be caused by inflamed or restricted fascia. 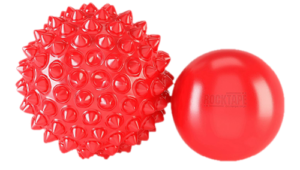 In short; Rockballs revolutionise what we have previously done with traditional spiky balls. Take your recovery to the next level, and ‘get a pair’! Have fun with your new balls. When you purchase a pair of RockBalls, you also receive a ‘How To’ Guide, and plenty more details on the proper actions. Available in clinic or to order.